Apologies to those of you with a big solitaire sparkler on your ring finger, but carat-heavy diamonds are no longer the apogee of engagement ring greatness. Throw away your rings, everyone! Throw them away now! The New York Post reports that an increasing number of couples are ditching De Beers and diamond solitaires in favor of designing their own rings, complete with colored stones or engravings unique to the bride’s preferences. Diamonds aren’t completely out of the engagement ring picture, but they’re no longer a solo star. The gorgeous .82-carat diamond Jason Crystal gave her was flanked by six purple sapphires, symbolic of the couple’s alma mater, Northwestern, where they met as members of the marching band. Etched along the outside of the platinum band were tulips and daisies sketched by Crystal, a 31-year-old sound designer; on the inside was a cat’s face, a nod to their beloved pet, Caprica. But just because there’s a decreased emphasis on diamonds doesn’t mean the cost of engagement rings is on the decline. In fact, according to Anja Winikka, director of The Knot, couples are actually spending more on rings, even as the number of couples opting for diamonds drops so significantly that retailers have to start slashing prices to get them out the door. 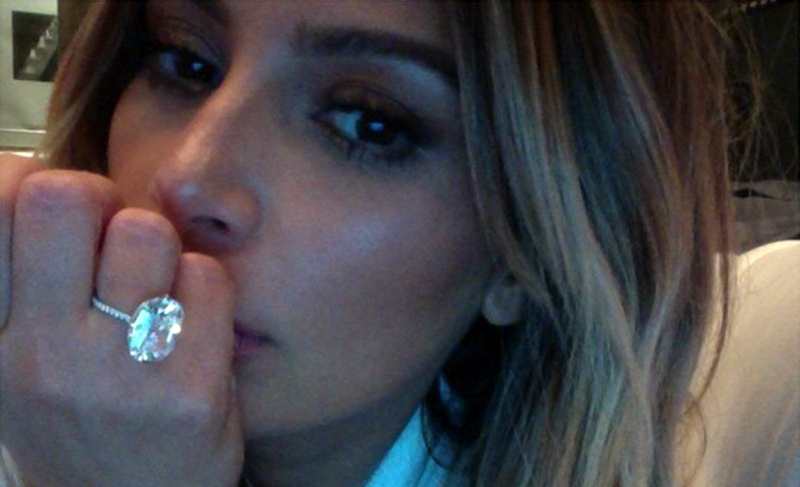 So what’s behind the shift in bling? Aside from becoming more savvy and recognizing that diamonds have only been associated with true love since the ‘30s (thanks to De Beers), millennials are being influenced by celebrities. Winikka says the celebrities driving the trend include Kate Middleton, who wears Princess Diana’s blue sapphire with diamond halo; Jennifer Aniston, who sports a gold-and-diamond band; and Scarlett Johansson, who has an antique art deco ring. But even if one’s intended can’t afford something as extravagant as a huge sapphire, rings are becoming more and more unique, with grooms often helping with the designs. Of course, that’s partly due to affection, but it’s also driven by the fact that accepting an engagement ring isn’t only followed by happy tears; for many people, the happy occasion now includes a full-blown social media offensive. “Ring selfies” are aplenty on social media sites, plus there’s even more bling imagery on Pinterest and Etsy, so it’s even easier for potential brides to send their partners pictures of rings they might be interested in, just so everyone’s clear that a plain diamond is no longer absolutely acceptable. The quest for unique spins on wedding traditions isn’t necessarily limited to the engagement ring: The aforementioned bride with the purple sapphire ring is actually considering a lilac or floral print dress to match the ring. Not everyone’s happy with this nontraditional approach, however. The bride told The Post her mother “nearly cried” when she heard mention of colored dresses.